Top row L to R: Coach Tim Jackson, Omani Morales, Rose Baty, Michayla Paige, Sarah Galloway, Alexa Thompson, Morgan Nauta, Katelyn Paige, Team Asst. Crystal Morales. Bottom Row L to R: Andrew Flierman, Alex Steil, Cody Marshall, Dane Conely, Josh Beebe, Jonah Drake, Ethan Plummer. Courtesy photo. 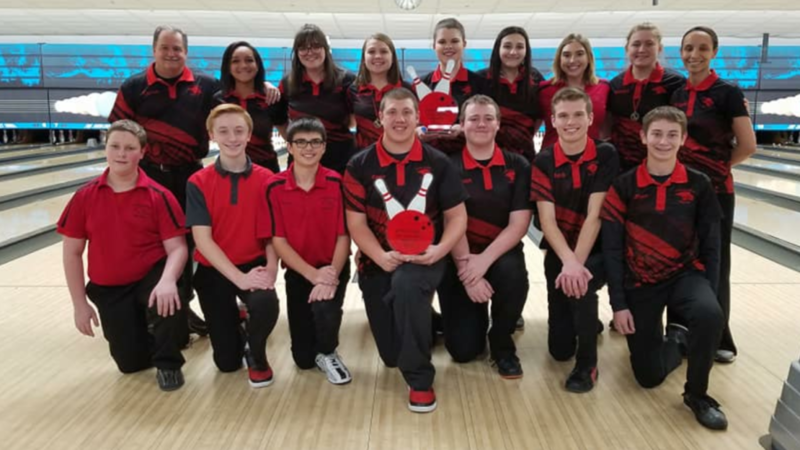 Cedar Springs bowlers had a non-conference match against Sparta on January 7, and both boys and girls won. On January 9, Cedar Springs had a conference match against Greenville. Boys won 20-10, with freshman Andrew Fliearman bowling his high school high of 196. The girls won 30-0, with senior Morgan Nauta bowling her high school high of 138. Cedar Springs attended the Lowell invite on January 12, and both the boys and girls won the tournament. They had one boy and four girls place in the individuals out of 12 schools. Senior Josh Beebe placed 5th with a 408; junior Omani Morales placed first 1st with a 407; senior Sarah Galloway placed 3rd with a 368; junior Katelyn Paige placed 7th with a 324; senior Michayla Paige placed 10th with a 304. The teams hosted a conference match against Forest Hills Northern on January 14. The boys lost 12-18 and girls won 20-10. The team traveled to Ottawa Hills on January 21 for a conference match against Ottawa Hills. The boys won 29-1 with Alex Steil bowling his high school high of 136. The girls won 29-1.